MIAMI, Fla. –– Javier, who has lived in Miami for the past 12 years, decided several years ago to return to his native Cuba to open a business. But the catch is he still lives in the U.S., and like others who are doing the same, has circumvented existing laws by working through relatives on the island. Javier, who did not want his real name printed, purchased a large house under his mother’s name in the hopes of transforming the home near the Carretera Central - the highway spanning the island - into a place where travelers can relax, eat a snack, and perhaps stay for the night. "I tried to do it here but I didn’t have any luck,” Javier said. It’s not uncommon for Cuban-Americans from Miami –mostly recent arrivals – to travel back to the island after saving enough money to open a business in their home country, boosting not only their incomes but those of their loved ones in Cuba - and also impacting the Cuban economy. “It’s a trend and I think it’s been going on for a while,” said Cuban-born Pedro Freyre, a Columbia University lecturer and expert in Cuban-American legal relations and chair at Akerman, a Miami-based international law firm. Freyre said he believes this has increased since President Barack Obama and Raul Castro announced last December 17th they were restoring diplomatic ties, which were broken in 1961. For the past few years, Javier has traveled to Cuba virtually each month to oversee the construction of his business. Most of the supplies were taken from Miami including, all the plumbing and electricity. Pavel Vidal, a former Cuban Central Bank official who now teaches at Javeriana University in Colombia and writes about the Cuban economy, says about 20 percent of businesses in Cuba operate with foreign investment, while 80 percent are opened by local Cubans with their own money, according to a recent poll he conducted. Several entrepreneurs who live in Miami and own businesses in Cuba were reluctant to be interviewed on this topic, saying they feared repercussions on the island. The businesses included an ice cream shop, a clothing store, a hostel, and a couple of paladares, which are privately-owned restaurants. Many of these entrepreneurs ship products from the U.S. to support their operations on the island. Orlando Hernandez, who has owned a shipping company called Cuba Carga Express since 2009, says he has shipped plenty of items for people opening businesses in Cuba. His clients include Cubans as well as Americans and Europeans. One American couple from Florida recently shipped beds and other products to Havana for a guesthouse they opened with the help of a local family. Some popular items shipped include those for the food industry, like barbecues and smoothie makers as well as items for party rental shops like popcorn machines and bounce houses, for children’s parties. Leonardo Sanchez-Adega, who worked for the first shipping company to send humanitarian supplies from Miami to Cuba, said he easily serviced about 1,000 customers between 2011 and 2013, who were specifically sending supplies for their businesses. “We sent entire kitchens, entire restaurants, in pieces,” according to Sanchez-Adega, who also created a website to support self-employed people in Cuba. Since importing products for commercial use is illegal in Cuba, items are sent in multiple shipments. So, an entrepreneur opening a paladar will send a couple of tables at a time to make it appear it’s for home use. Or for someone who owns a clothing store, sending 60 pairs of pants in one shipment would be too obvious, so they send 10 pants to six relatives or friends. Javier, who works in Miami as a handyman, arrived in the U.S. in 2000, after two failed attempts to cross the Florida straits on a raft and after spending one year in a Bahamian prison when he was intercepted by officials there. When he finally made it to the U.S., he tried to open a business, but said it was impossible because he was unfamiliar with the laws and regulations. “Here it’s too difficult to open a business,” he said. That’s when he thought of giving it a try back home. Technically, it’s illegal in both the U.S. and Cuba for an American citizen or resident to own a business on the island. But those doing it are circumventing the law by working with Cubans on the ground. Freyre said he thinks that while both governments have an understanding this is going on, they won’t clamp down on the entrepreneurs because “they have a lot of other things on their plate.” Javier echoed the same feeling, saying he’s not afraid of running a business in Cuba because the government knows what’s going on. “The government is giving a blind eye because we’re solving a problem for them,” he said. There is potential for this to have a positive impact on Cuba because the businesses will create jobs and there could be cases where there is a shared enterprise, said Ted Henken, a Baruch College professor and author of Entrepreneurial Cuba: The Changing Policy Landscape. Vidal thinks the most important contribution of these businesses is private employment at a time that the government is trying to cut the number of public sector jobs. “This compliments the reforms the government is trying to implement on the public sector,” Vidal said, adding that it also raises the level of productivity, which is necessary in order to have higher state salaries. 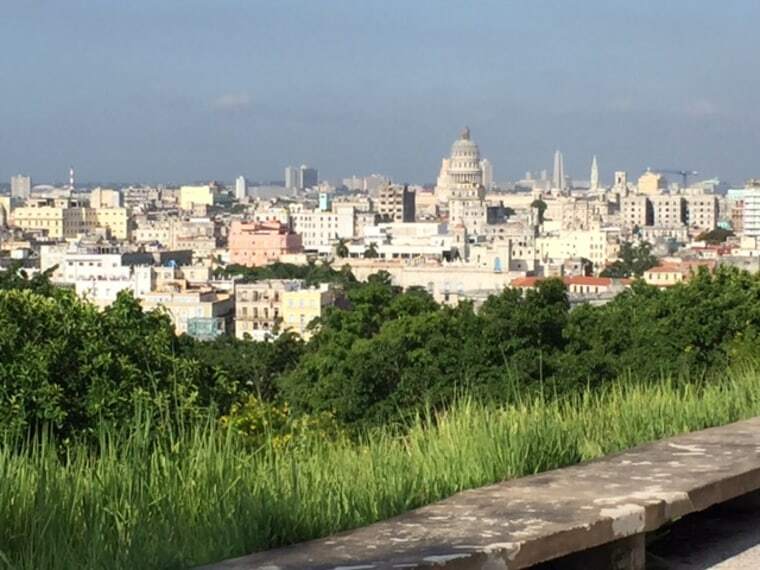 But while the U.S. embargo on Cuba continues, the level of U.S. investment in Cuba will be limited. Freyre said what is important is the synergy between the two shores. “They’re ahead of both governments. The governments have to catch up to the reality on the ground,” he said.